La Conner is conveniently located half way between Seattle, WA and Vancouver, BC. The La Conner Channel Lodge and Country Inn offer a nearby escape perfect for all events: Board & Staff Retreats, Association Meetings, Leadership Trainings, Budget Planning Sessions, Nonprofit Conferences, Church Retreats, Reunions, Banquets, Holiday Parties, and more. Our outstanding hotels and staff can host groups from 5 people up to 200. We provide all inclusive services from start to finish, so let us do all the work for convenient, easy planning. First class catering, group dinners, and group activities are all tailored to fit your event. The Dunlap Room is onsite at the Channel Lodge and is perfect for groups 5 to 20 people. This meeting room has a built-in screen, tables and comfortable chairs. 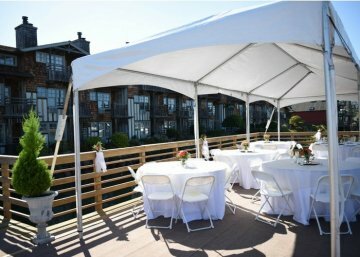 Beautiful for weddings, cocktail parties, and other social gatherings, our private observation dock has unmatched views of the Swinomish Channel. Capacity for this space is 84 people sitting or standing. For detailed conference room specifications, please see the PDF downloads for each meeting space. Contact the Sales Department about pricing information for additional meeting materials and supplies. 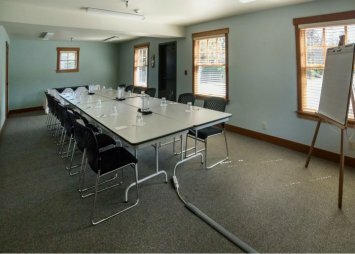 Interested in booking one of our conference rooms? We would love to help you get started! Please contact our Sales Department by phone or email any time! Catering menus vary and can be customized for every group. Oyster & Thistle’s Chef can create and edit menus based on a per person budget. They are also our Number 1 choice for group dinner reservations. For your convenience, we have compiled a list of our preferred vendors. Please contact our friendly staff to set up your perfect event! We’re here to give you personalized attention.